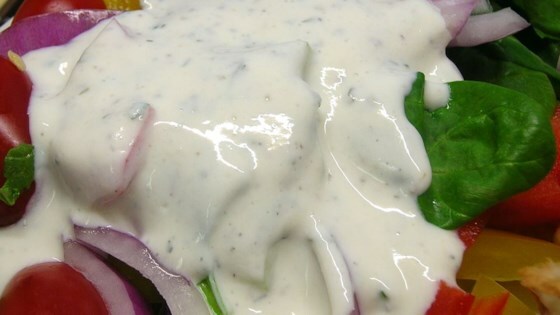 "If you do not like mayonnaise, this recipe is for you! It's so creamy, you'll never be able to tell that it's reduced fat!" Place sour cream and buttermilk into a mixing bowl. Season with parsley, chives, garlic powder, dill, onion powder, salt, and pepper. Whisk together until smooth. Cover and refrigerate at least 30 minutes before serving. This recipe great but I added about two tablespoons of vinegar and it made it even better! Love it! Love it! And we like mayo, too. It's a great all around dressing to doctor up or not. Do try it! Leftovers a long time in the fridge, too.